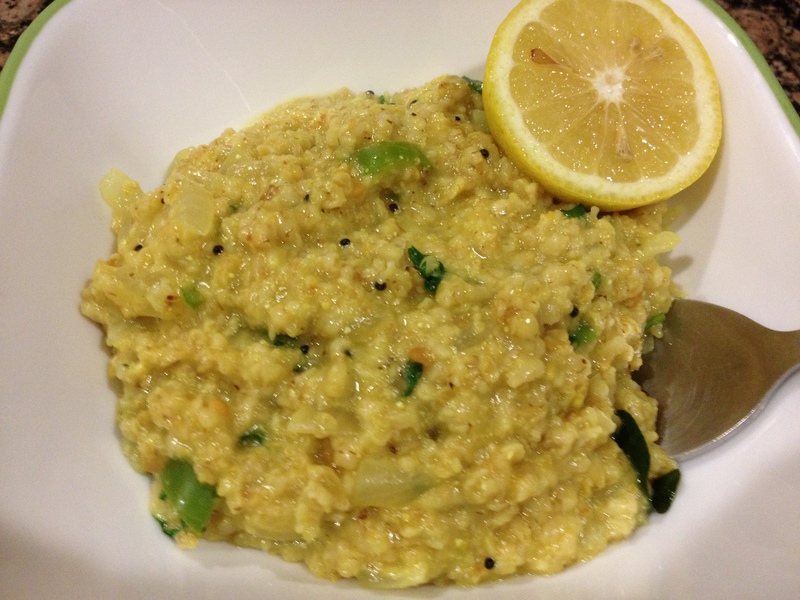 For all indians, you know how to make upma and this one is just using oat. Just roast it for few mins and then same recipe. For others, if you like spicy food like my coworkers, here’s how you can make it with minimum ingredients. Roast 1 cup oat dry few mins so it won’t be sticky and if u don’t mind sticky, skip this step. Heat oil, add either cumin seeds or mustard seeds whatever you have. Cumin seeds will turn little brown and mustard seeds will crack,jump around so be careful. Add 1/4th cup chopped red, white or yellow onion. Add chopped green pepper or jalapeno or green chilies depending on how spicy you like. Start slow though. Saute onion for few mins and then you can add chopped tomatoes if you like. I didn’t. Add pinch of turmeric powder and now add your roasted oat. Add water(Microwave for a min so it’s warm). Add salt and when oat is done, add 1 tsp sugar. Add some cashews or any nuts you like. You can squeeze some lemon, lime over it and garnish with cilantro. It’s easy and very quick.